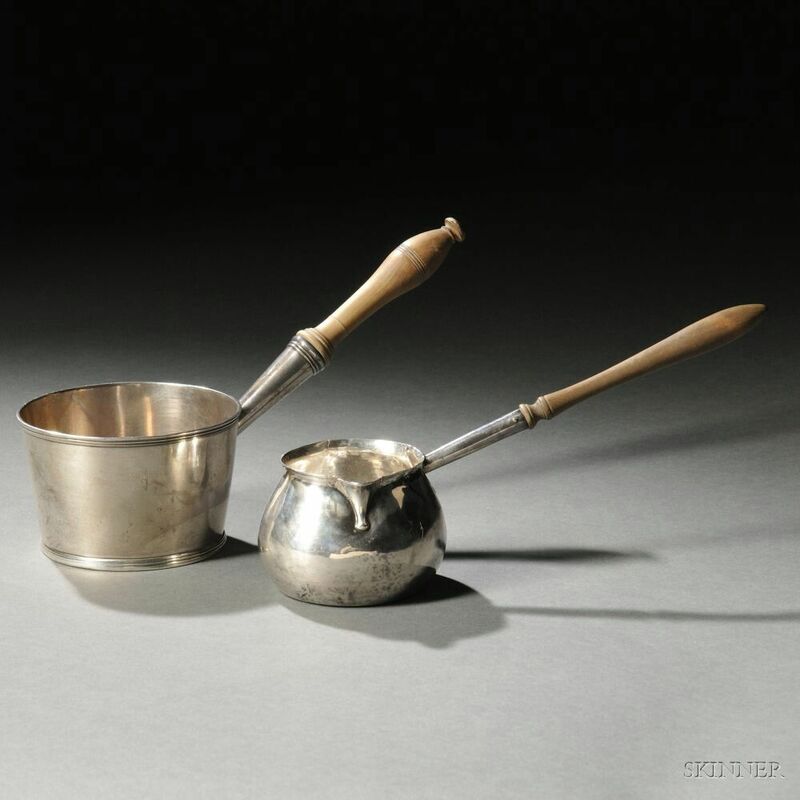 Two Georgian Sterling Silver Brandy Warmers, one London, probably 1732-33, rubbed maker's mark "TT," probably for Thomas Tearle, with flared rim, spout, bulbous body, and turned wood handle, body ht. 2; the other Chester, 1799-1800, William Twemlow or William Tarlton, maker, the tapered cylindrical body with molded rim and foot, engraved with an armorial, and with turned wood handle, body ht. 2 1/4 in. ; approx. 8.0 total troy oz. London: metal fatigue and repairs to rim and join of body to handle. Spout slightly indented. Scattered light dents and pin pricks. Black specks of silver rot. Surface abrasions and usage wear. Wood handle replaced and loose. Base stipple engraved "EO." Chester: Repairs to footrim. Shallow dents, surface abrasions, and usage wear. Scattered black specks of silver rot.